According to her family, Sarah Brisk Shoer was a strong individual. She was certainly determined. The young man she loved had emigrated from Latvia to the United States. Although very young, she followed him to Marquette, Michigan just a little over a year later. Sarah was traveled alone and may have told the ticket agent she was going to see her 'brother'. Mendel Shoer and Sarah Brisk were married on 8 February 1910 in Marquette. Their marriage lasted 49 years until Mendel's death in 1959. 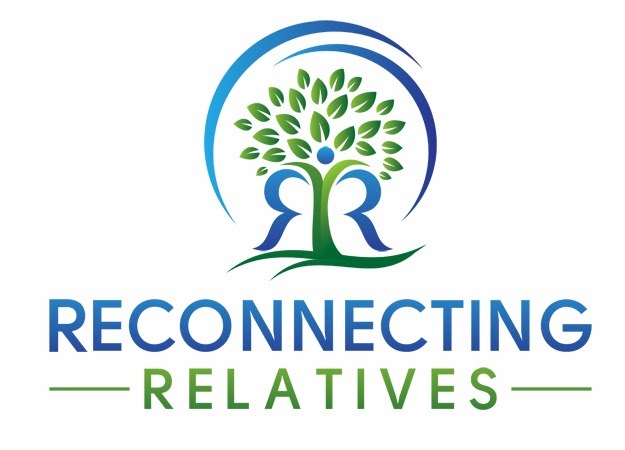 Many women after almost fifty years of marriage and the death of their spouse would just sit back, relax and enjoy their children and grandchildren. This was not the case for Sarah, who was called Bubbie by the family. It seems she was a bit of an activist and we have the pictures to prove it. Bubbie is second from the right. You can identify her by her ankles. Please notice the details; nylons, polished shoes, best clothes, jewelery and purses. They are going somewhere special. Zoomed into the photo, you can read the ribbons; Medicare Now and Massachusetts. 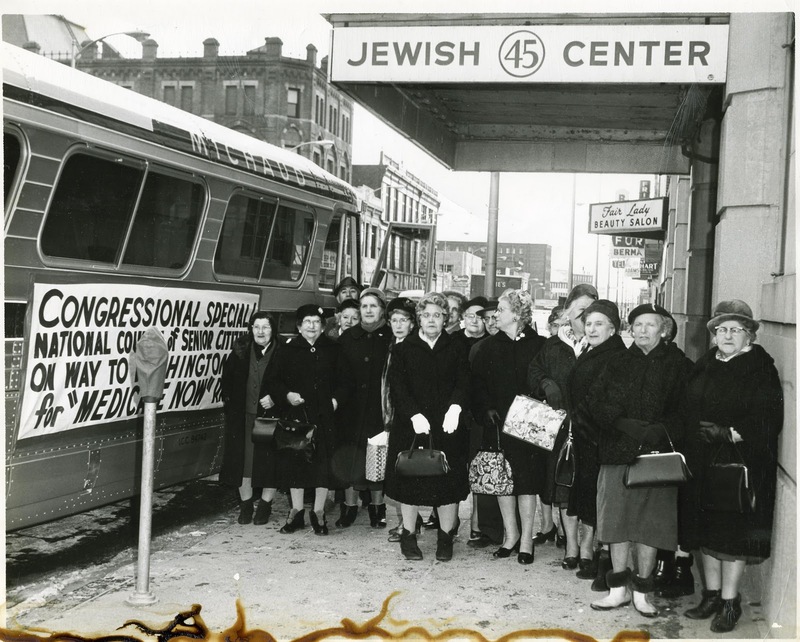 Here are the same women standing next to a bus. 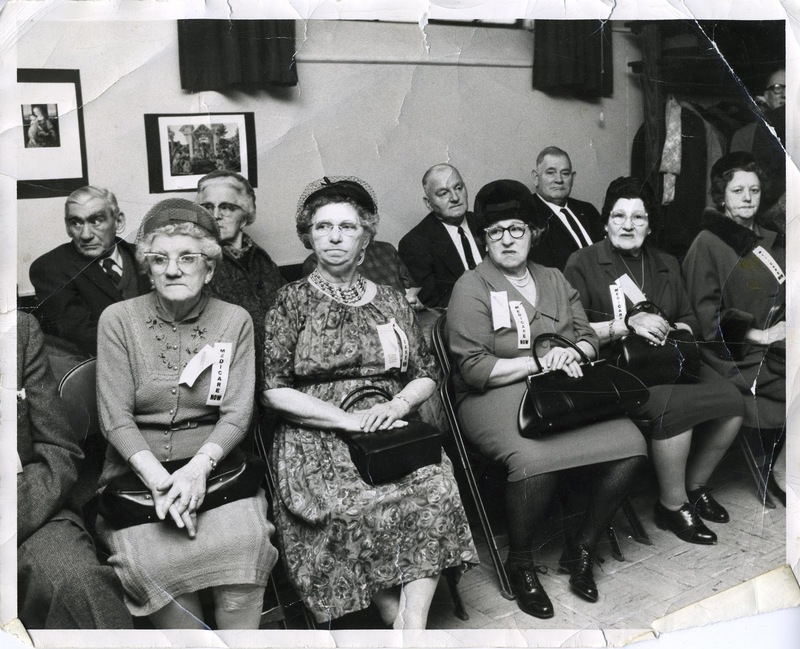 Bubbie, again identifiable by her bowed legs, is on the far left next to the sign. 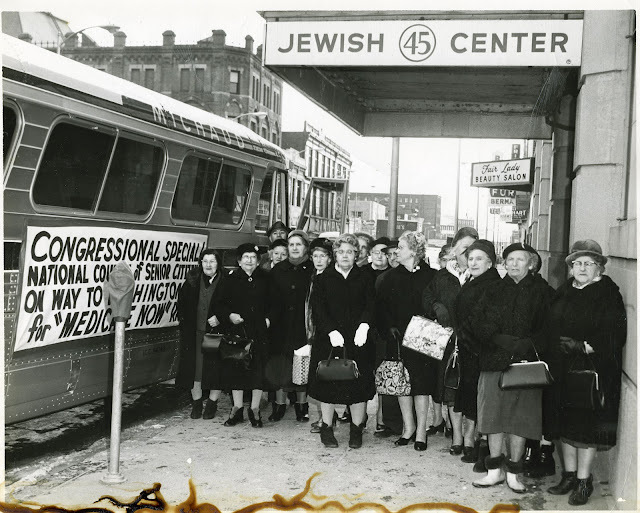 They have donned coats and boots and appear to be getting ready to board the bus. Could they actually going all the way to Washington? In 1965, Bubbie was about 77 years old. That's a long bus ride. See what I mean about determined? 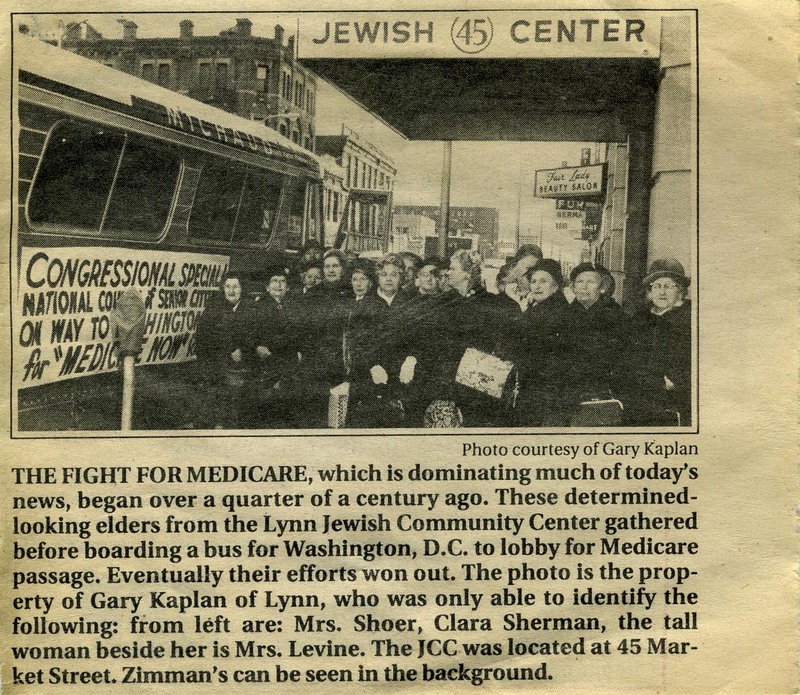 In January 1965, the Medicare battle was heating up and these seniors were organized and brought to Washington. They were not forced. They must have felt strongly enough about the importance of Medicare that they were willing to leave their comfortable homes and ride to Washington. What did they do once there? Perhaps another family member will fill us in on more details. How lucky MJ's family was to have such a Bubbie. She is probably the source of much of the family's strength and willingness to do what is necessary, whether leaving the old country for a better life in the new or riding a bus to Washington in the middle of winter. There are a lot of characters among descendants of Sarah Brisk and Mendel Shoer and the world is better for it. Wow, this is a great story. I love how you have the actual photograph from the newspaper article, too. What a determined group of ladies! Thank you Heather. Yes, we should all be so determined!